We offerIf Your Putting is Not Good – Why Not Start from Scratch with an Individually Fit Custom Putter! Starting from scratch with a custom-built putter can be a benefit to those golfers that struggle on the greens. You need a custom putter built to suit – tailored to fit your individual stature, hand position, stance, and stroke. The golfer has to be comfortable with his or her stance. One needs to be in a body position to make good consistent ball contact. Most people do not have the perfect putter position you find in videos and books on golf. Each person’s body shape and position are unique. Finding the right combination of six key points (lie, height, weight, loft, balance, and grip) for your body type and stroke is critical to producing quality strikes and consistent putting. The wrong fit of a putter can lead to bad posture, a questionable pendulum swing, and inconsistent contact. At Better Golf Shot, we build custom putters with heads available from several different independent companies. We also buy from the three major clone club head manufacturers in the world. While there are unique designs available, clone putter heads are nearly identical to the top name-brands. Additionally, the cost can be half the price or lower. Finally, the appearance, feel, and “playability” of these clones matches their counterparts – in terms of overall visual look and technical specs. We have extensively tried and tested these putter heads. We’ve found them to be close enough to the OEM models that the reduced cost makes it a great value for any amateur golfer. Many variable grip options are available for a putter. Under the rules of the game, the putter is the only grip that can have a flat edge. Commonly this flat edge is placed facing away from your body, to help guide you to exactly where your thumbs should be on your grip. Manufacturers have developed a host of materials available for putters. We spec out and offer different sizes, lengths, weights, and diameters to improve your ability on the greens. A thicker grip helps take your hands and wrists out of the stroke, which is what golfers seek to do to improve their putting. The drawback of a thicker grip is that you won’t get the same level of feel of a standard grip as the vibrations coming up the shaft will be dampened down. Therefore, if you are a “feel putter” or have a stroke that involves a lot of wrist action, then you are more suited to a standard grip. Then counter-balance factors into the equation. Better Golf Shot has all the tools and various adapters to custom bend putter shafts for lie, which is a critical facet of an individualized putter. Most importantly, we have a variety of weighting techniques to counter-balance your new putter. 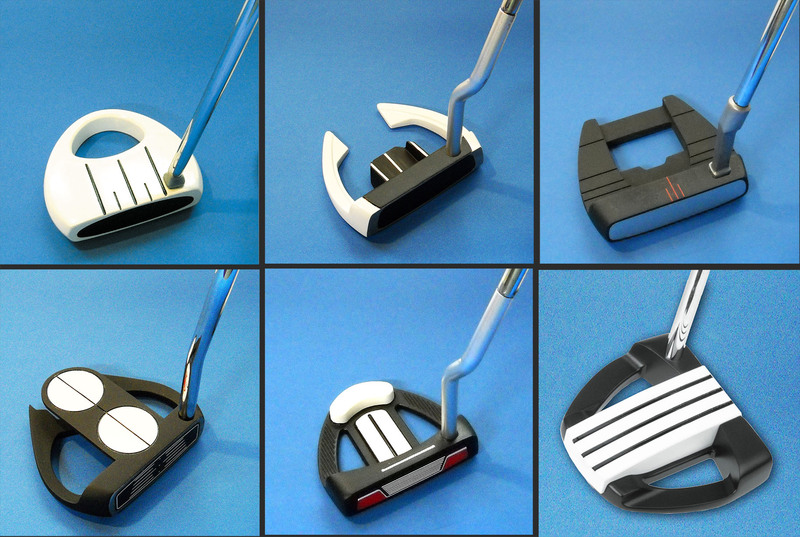 The picture grid below shows a few examples of the custom fitted putters built for customers. We have many more putter head designs available.